THERE ARE moments when I find more comfort in the presence of books than people. Reading is one of the very, very few things I do that keep me quiet—the others include sleep and prayer, but even those sometimes have me saying things aloud. I turned to reading during the last few weeks leading up to the Board exam; I went back to it after my application for residency. By reading, of course, I mean me tackling non-academic, non-medical pieces of literature; including my medical textbooks will inevitably bloat my reading list. When I read fiction (don't say “pocket books,” unless you're reading a Mills and Boon paperback romance), I am transported to other worlds created by the author's mind. Why that's so thrilling is something only readers will understand—a thrill that, in my opinion, should be experienced by all. But, alas, not everyone has the patience for the written word, let alone pages and pages of it. But the truth is that much is lost when one forgoes reading—a perennially recurring tragedy, what with the advent of smart phones and tablets, leaving people, especially impressionable children, more adept at computer games than self-examination and empathy. Fury by Salman Rushdie. Malik Solanka is a historian from London, made rich and famous by his doll collection, which the national TV stations had picked up and turned into a show. Despite his financial and professional comforts, Professor Solanka abandons his wife and child for New York. He wants to protect his family from himself: at one point he wakes up in uncontrollable anger, and he goes to his wife's room with a knife. Meanwhile he rediscovers himself in New York, goes through weird relations with disturbed women in the art world, only to find himself prisoner to a European country so inspired by his story (he is a writer, too) that the leaders have translated his subversive fictional ideas into national reality. Housekeeping by Marilynne Robinson. It's one of my all-time favorites: a depiction of loss and impermanence told through the lives of Ruthie and Lucille, and their eccentric aunt, Sylvie, in Fingerbone, Idaho. All That Is by James Salter. Philip served in the military during World War Two (there was mention of Leyte and the Philippines in the first few chapters), then he went to New York to find a career in editing books. His first marriage rather ends abruptly. From then on he has serial relationships with women. He meets most of them in wine-and-cheese parties of the Manhattan intelligentsia or during his foreign trips. I am led to believe that his life is reflective of cosmopolitan adult life, such that many of his friends are divorced, like him. From a Christian perspective his life is wasted, a tragedy masquerading as modern-day success. King of the World by David Remnick. 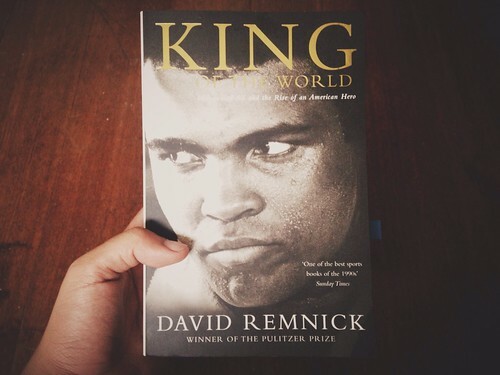 I don't care much about boxing, so it came as a suprise for me to pick this book. Not a surprise, when I look back at it, because I'm a big, big fan of David Remnick, editor-in-chief of The New Yorker, one of my favorite magazines in the world. Cassius Clay, who would later join the Nation of Islam, a Black-American version of Islam, and change his name to Muhammad Ali, is, according to Mr. Remnick, a picture of the Black American's journey to success. Intertwined with blow-by-blow accounts of knockouts in the arena are the backstories of Ali, the previous heavyweight champions Floyd Patterson and Sonny Liston, and their role in the Black American battle for equality and justice in the 1950s. Oh hey, Westerns, Agatha Christie's, Dr. Who's and lots of other genre books count as pocket books. To Kill a Mockingbird and Catcher in the Rye count as pocket books too. My bad. Kaartehan ko lang siguro 'yun. Hehe. My personal preference, though, is to call works of fiction just that--"fiction." It is more accurate and informative to refer to books by their genre--which, I feel, removes certain ambiguities--rather than by their physical appearance. By definition, a "pocketbook" is a "paperback or other small or cheap edition of a book." It refers more to the book's outward appearance and size, perhaps price, rather than to its substance. The word "pocketbook" probably originated from Pocket Book, a division of Simon and Schuster, which first published cheap paperbacks in the 1930s. James Hilton's Lost Horizon, even Shakespeare's Five Great Tragedies, were published as pocketbooks. But I've seen copies of To Kill a Mockingbird too big to be called pocketbooks. I'd rather read hardcovers, but they cost more. The short of it is: I just like to shy away from that word.